Josh Tymon gets tackled against Scunthorpe. 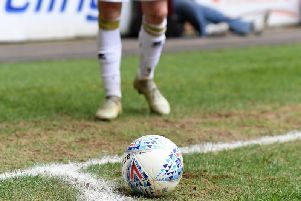 MK Dons will play League 2 football next season after losing 2-0 to Scunthorpe in their final game of the season at Stadium MK. First half goals from Rory McArdle and Ivan Toney ensured safe passage for the Iron, sealing Dons' fate at long last. With relegation all but assured heading into the final home game of the season, Keith Millen named an unchanged side to face Scunthorpe, with Scott Golbourne keeping Dean Lewington out the side, while Aidan Nesbitt returned to the squad on the bench. Needing nothing short of a miracle, the game coasted for the most part of the opening 20 minutes. Hakeeb Adelakun, who scored in the reverse fixture earlier this season, fired a in a low effort early on which was well gathered by Wieger Siestma. There was little the keeper could do on 19 minutes though when Rory McArdle was left unmarked to glance home Adelakun's corner and give Scunthorpe the lead. Sietsma, who came under fire for his performances against Doncaster, Southend and Bradford since replacing injured Lee Nicholls in goal, made two strong saves to deny Ivan Toney twice, once from a one-on-one, and then from a melee in the penalty area as Dons were once again undone at a set piece. Toney though would have the last laugh on 34 minutes, heading home Josh Morris' cross from the left, finding the top corner to leave Siestma with no chance. Dons, needing a huge performance, looked beaten from the opening minute. Clearly low on confidence, they barely mustered a shot on goal until first half stoppage time, when Marcus Tavernier and then Chuks Aneke fired straight at Matt Gilks. With the writing effectively on the wall by the time the second half kicked off, the game played out as a bit of a dead rubber. Dons though showed a bit more spirit and gusto as the half wore on. Substitutes Robbie Muirhead and Kieran Agard dragged some life into the affair, with Muirhead's balls into the box from the left flank causing havoc with the Scunthorpe defence, while Agard's tenacity lifted the crowd as he chased down everything in his direction. For all their huff and puff though, they were still limited to half-chances. Tavernier and Agard came closest to poking home Muirhead's crosses, but Gilks remained largely untested.